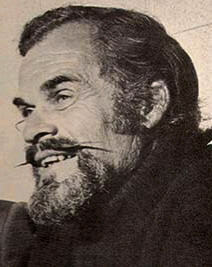 Longtime Oakland Athletics play-by-play announcer Bill King passed away on October 18, 2005, at San Leandro Memorial Hospital after suffering a pulmonary embolus. King was originally admitted to the hospital last Friday where he underwent hip surgery. King was the radio voice of the A’s since 1981, the longest tenure of any A's announcer since the team's games were first broadcast in Philadelphia in 1938. Prior to joining the A's, he had been the radio play-by-play announcer for the Oakland and Los Angeles Raiders football team and the San Francisco and Golden State Warriors basketball team for many years. Arguably the most well-known and best recognized sports announcer in the San Francisco Bay Area, King was born in Bloomington, Illinois and was stationed on the island of Guam at the end of World War II when he began his broadcasting career with the Armed Forces Radio Network. He launched his sportscasting career in the late 1940s in Pekin, Illinois, broadcasting high school football and basketball games as well as minor league baseball games. He later announced basketball games for Bradley University and basketball and football games for the University of Nebraska. King moved to the Bay Area in 1958, when the San Francisco Giants baseball team hired him as an announcer, together with Russ Hodges and Lon Simmons. He also announced University of California football and basketball games during those years. A major turning point in King's career came in 1962 when the NBA Philadelphia Warriors moved to San Francisco and hired King as their play-by-play announcer. King announced Warrior games from 1962 through 1983, through the Wilt Chamberlain, Nate Thurmond, and Rick Barry eras, and the team's only NBA Championship on the West Coast in 1974-1975. In 1966, while continuing to call Warrior games, King was hired as the play-by-play announcer for the Oakland Raiders, then of the American Football League, a post he held until after the 1992 season, after the team's move to Los Angeles. He announced the Raiders' three Super Bowl victories, as well as countless other memorable games including: the infamous "Heidi" game against the New York Jets in 1968; a string of last second victories on George Blanda field goals during the 1970 season; the "Sea of Hands" game against Miami in the 1974 AFC Playoffs; Dave Casper's "Ghost to the Post" touchdown reception that gave the Raiders a 1977 play-off win at Baltimore; the memorable "Holy Roller" play against the San Diego Chargers in 1978; and "Old Man" Willie Brown's interception return for a touchdown in Super Bowl X. All are regularly replayed and will forever be a part of the game's lore. Though carrying a substantial workload as the announcer for two professional sports teams, King was persuaded by the new owners of the Athletics baseball team to become the Voice of the A's in 1981. King continued to call Raider and Warrior games, though he retired as the Warriors' announcer after 1983 and as the Raiders' announcer in 1992. For the first fifteen years as A's announcer, King was paired with another long-time Bay Area sports announcer, Lon Simmons, with whom King worked briefly with the Giants in 1958. He was there during the "Billyball" and "Bash Brothers" eras, as well as the Moneyball era of today. Former Athletics' announcer Greg Papa, who worked alongside King for thirteen years, says of King: "Bill is without a doubt the best radio play-by-play announcer I have heard in all of sports. His energy, preparation, his thoroughness, his word choice---he is without peer." King was known on broadcasts for his catchphrase "Holy Toledo!" and recognized by his distinctive handlebar mustache and beard. He lived on a houseboat in Sausalito, California.